Toby Thaler speaks to gathered media at November 27 announcement of MHA appeal. A coalition of 24 neighborhood groups announced an appeal of the City of Seattle’s Mandatory Housing Affordability (MHA) rezone plan. 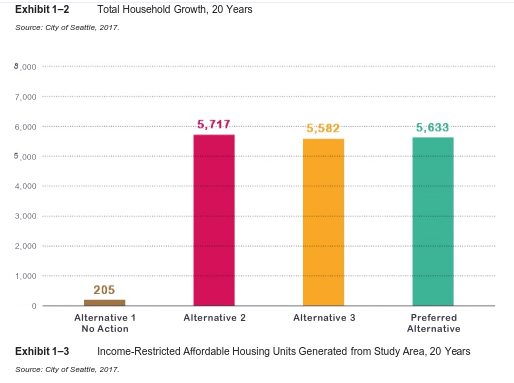 The alliance calls itself the Seattle Coalition for Affordability, Livability, and Equity (SCALE) and threw a litany of complaints at the proposal, claiming the status quo would be better for affordability despite the evidence to the contrary. “The proposed approach would increase the bulk and scale in residential and neighborhood commercial areas; reduce access to light and air; increase traffic; exacerbate parking problems; reduce tree canopy; and otherwise reduce the livability of Seattle’s neighborhoods. Such impacts would make Seattle less attractive for development and, ironically, reduce the ability of HALA to provide funding for more low income housing,” SCALE’s Notice of Appeal states. The Housing Affordability and Livability Agenda (HALA) has been three years in the making with MHA the crown jewel in an armada of 65 policy suggestions produced by a 28-member stakeholder group of housing advocates and developers. 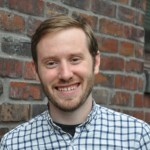 The Seattle Office of Planning and Community Development (OPCD) attempted a multiyear community engagement process to implement the MHA framework, which pairs upzones with inclusionary zoning requirements. OPCD published the Draft Environmental Impact Statement for MHA in June and followed up with the Final Environmental Impact Statement (FEIS) earlier this month. Councilmember Johnson, who chairs Planning and Land Use and Zoning committee, anticipates the process will continue as scheduled while the City sorts out the appeal. Description of changes was too vague. Doesn’t describe the existing land use environment for each neighborhood or what would change. Didn’t compare to existing neighborhood plans. Mitigation of land use impacts. Tree canopy impacts (supposedly runs afoul of segmentation rule by using 2035 Comprehensive Plan EIS). Mitigation of tree canopy impacts. Noise impacts, such as from traffic or construction sites. Mitigation of air quality impacts. It’s hardly surprising to see Seattle Fair Growth and other choice community councils leading the charge against MHA. These homeowner groups have been engaging–sometimes to derail the various meeting and hearings the City has hosted. Additionally, SCALE members have advocated for contradictory policies. Groups like Seattle Fair Growth and Wallingford Community Council have campaigned to put more zoning capacity along SR-99 even while their appeal bemoans the air quality impacts of putting housing too close to highways. It’s hard to see how they can have it both ways. It seems a reasonable Hearing Examiner would see SCALE’s voluminous complaints for what they are: concern trolling and desperate delay tactics. Much like a sports team that calls a bunch of timeouts at the end of the game even when the outcome is clear, SCALE is seeking only more time until it faces its inevitable loss. The whole appeal is available online for those looking to subject themselves to it. The featured image is from the video SCALE posted on its website and features Toby Thaler with other SCALE members behind him at their Monday press conference . I live in the Madison-Miller Urban Village and am very supportive of MHA and the years-long outreach process the city conducted. The “Madison-Miller Park Community” group DOES NOT represent the voice of our neighborhood!! Cheapest houses to buy are usually the older houses. Cheapest houses to rent are the older houses. No one in the city is creating affordable housing in any #’s because building new affordable housing is too expensive and no one can make a profit and stay in business building affordable housing. Enough nonesense about blaming others, ” It really is about townhomes destroying affordable housing that would otherwise last for generations” this is the truth, anyway you look at it. Disgusting display of classism and “I’ve got mine, so tough luck.” Can these NIMBYs be counter-sued for blocking affordable housing and driving ordinary folks out of the city? The only affordable housing we’re blocking, is a small potential increment of subsidized housing, years down the road when the MHA fees have added up and the housing has been built. For this, our “grand bargain” traded responsible urban planning for blanket upzones. We don’t think that was a good deal – and apparently neither do developers, the smaller “master builders” crowd who reportedly have plans to challenge it vs. state law. If you really want to go after someone who’s been driving ordinary folks out of the city, you’re going to have to look at the mayor and council who’ve been talking “crisis” while putting all the wood they can find on the fire. What evidence to the contrary? High priced housing due to demand from high income earners. Limited physical space close to downtown which is surrounded by water. Zoning is not the issue. No profit or ability to build affordable housing by builders, too much demand and profit to build market rate rentals. Can’t run a business with high costs and low profit margins. Homeowners playbook of taking equity and plowing it back into another house to create more equity, that has always been the smart play in Seattle. Price jumps in Seattle is a catch up for Seattle being undervalued relative to other high tech cities with limited physical space to build. In a nutshell, people want to live in neighborhoods close to downtown, due to traffic issue of living elsewhere, and many have the means to do so. Seattle needs more single family houses to ease prices, that is where the demand is. I agree that Seattle needs more houses for families. There’s also nothing wrong with detached single-family homes per se, but they are naturally more expensive. Rowhouses, townhouses, stacked flats and the like are all needed to provide more homes for families in the city. They are still single-family homes, but in a more affordable form than detached homes. Existing homes are cheaper than newer homes. Certainly, but smaller homes are also cheaper than bigger homes. In a detached single-family zone, new housing creates the worst of both worlds: it is more expensive and it does not increase our housing stock. Contrast that with multifamily zones. In this Sightline example (http://www.sightline.org/2017/08/30/map-where-multi-family-homes-make-seattle-neighborhoods-more-affordable/ ) an old detached single-family house is turned into rowhouses. Though the price of each single-family house is a little more expensive for less square footage, our housing stock increases, and that’s a good thing. Now, it’s unfortunate that a developer is pocketing all that extra cash derived from the value of the land, but these smaller projects tend to be local in nature anyway, so it’s not as egregious. I think you have it wrong. Detached single family housing is what people are demanding and the cause for the hot market. Not everyone living in the city wants the density you talk about. The market is speaking, it is saying people want to live in a close in neighborhood in a detached house with a yard and a garage. If that wasn’t true, prices would not be increasing at such record rates. That would make sense if detached houses were the only hot part of the housing market, but prices are rising across the board. People want family housing, and the best way to meet that demand is to build in a denser, more affordable configuration. I want to repeat that there’s nothing intrinsically wrong with detached houses. The problem arises when those houses are frozen in amber by zoning, then replaced by unaffordable and uncharacteristic McMansions. Subtracting the conspicuous but not really so common new construction single family houses, it gets harder to believe that redeveloping with townhomes is an affordability win. The houses that get leveled for this are commonly showing their age, and often occupied by renters, families or other groups who can make use of the space. They are packed up and moved out to Everett etc. The townhomes that sprout up are closer to $1M than $500K, and better suited to a couple with no kids (roof deck?) A significant proportion (quarter?) of single family is occupied by renters, usually modest dwellings with mortgages often paid off and widely varying rents. All buildings have a lifespan. The question isn’t whether or not the buildings you’re talking about will be replaced but what will replace them. It’s purposely misleading to portray this as a choice between keeping the old low quality housing versus getting new townhomes. The real choice is new townhomes or new/refurbished single family homes. I’m living in a house that was built in “1900” – I don’t know if that’s an exact date, or just the number they use when it’s prior to their records, and this house is no million dollar craftsman bungalow – unevenly spaced joists, poorly done modifications, etc. But it’s ca. 120 years old. It’s LR1 here. This house is not facing a choice between new SF or new MF, it will still be here when the townhomes next door are ready to tear down. The house that was torn down to put them in was later and better, structurally, than ours, from what i could see just touring the basement. It really is about townhomes destroying affordable housing that would otherwise last for generations. Yeah, the townhomes will decline in value much faster, but that’s part of the problem. It’s great that you are committed to keeping your home standing. But your ability to do so should not preclude others from deciding that it’s time to rebuild. As I’ve said before, there’s nothing wrong with detached houses, it’s only a problem when they’re frozen in amber by zoning. If we take your preservation philosophy to its logical conclusion, we get San Francisco, where the well-used “naturally affordable housing” is nowhere near affordable. the notion that single family homes in wallingford, zoned either single family or LR – are ‘affordable housing’ is maliciously incorrect. these are wallingford’s SF home sales the last 12 months. none of these are remotely affordable, and claiming thusly should get one banned from discussions on the topic. this is why single family zoning must be abolished. this is why single family zoning exacerbates gentrification. Are you an a low income renter with no wealth? Has the house you’re talking about had any money put into it over the last ~100 years? Sure, that’s part of how this housing category works – it’s maintainable, on a pretty long term. It isn’t comparable to new build, and that’s why there are people living in my neighborhood with very modest incomes, in older, paid off houses that aren’t going anywhere – unless torn down for townhomes. That’s the affordable housing we have in Wallingford, and outside of any subsidized units and possibly apodments, that’s about all we’re going to have. Every one that gets torn down is a step away from affordability. Obviously (to the other follow-up) this is not affordable ownership, which simply is not gong to happen no matter what – MHA upzones aren’t going to change that. Yeah, a townhome could sell for appreciably less than a decent SF, but you can’t ignore the value/cost and what kind of equity you have in a structure like that. But in any case, it isn’t clear that these upzones will cause more production – the developers in that category don’t sound real wild about MHA. You criticize MHA for how it will affect renters but the affordable examples you always give are homeowners. Homeownership isn’t affordable and likely exacerbates the housing crisis for renters. Excuse me, I didn’t make myself very clear. The people I meant, modest income living in older paid off houses, are indeed renters. Luckily out of immediate danger, as we’re a couple blocks way from the urban village. You’re right, in Seattle there isn’t such a thing as particularly affordable ownership, but on the other hand, paying Seattle rents and getting no equity out of it doesn’t seem like a great long term outlook either. We should be looking at suppressing real estate speculation as a significant factor in the ownership market. The older houses you’re describing detoriate. The owners either invest money in the house, sell or let the house detoriate. In the first scenario, typically requires raising rents. In the sending scenario the renters have to move. In the last scenario renters get substandard housing. Eventually owners also die and sell, which usually results in renters being forced to move. None of these scenarios are improved by not having an affordability requirement or requiring lower density. Interesting theory, but my neighbors are real. Or were real, in the case of the house that was torn down – because LR1. I’m sure your scenarios play out here and there in SF, but in LR1 it’s a sure thing – houses that have accommodated their middle income renter families for decades are torn down for townhomes, and high income professionals move in. You’re ignoring what happens to renters in single family zones. If people were demanding single-family housing, we wouldn’t need to ban the alternatives with single-family zoning. That single-family zoning exists is an admission that single-family housing can’t compete on the market without help from the government. SF Zoning can’t compete? Whoa! SF zoning has ruled the real estate market in Seattle for years. and will continue to. Renters are the once begging for government intervention to somehow help them become single family home owners. Again owning a house close to downtown with a yard and a large is what people want, desire. Hence the continued high demand and prices. You do not need single family zoning to build single family housing—SFH is legal in other residential zoning codes. The only way single-family housing could be equated to single-family zoning would be if competing land uses were so overwhelming—in other words, in such high demand—that no one would ever build a single family house if they had any other choice. Furthermore, zoning does not rule any market of any kind, because zoning is not a market activity. It is a legal/political activity. Talking about the “market” for zoning is like talking about the torque of my tupperware. Nope, not us (large house, tiny yard) nor our next door neighbor (small house, no yard) – both near downtown, but without mandatory attachment of more land than either of us found necessary or desirable. But the only reason the market was able to satisfy our demands was a relatively rare and complicated grandfathering scheme for a very few pre-modern-zoning lots. In most of our neighborhood, “the market satisfying our demands” has been made illegal by SF 5,000SF zoning. THANK YOU! By changing these outdated zoning ordinances, people will have the option to build more types of homes. 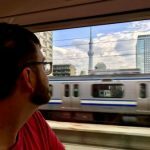 Single family homes can (and will) still be built; they just wont be the only option in Seattle’s more opportunity rich areas! Clinging to the past will not protect us from the future. This is the same group of people who support policies that have been failing us on affordability for decades. Look at the track record of protecting current housing stock. That is EXACTLY what we did for years, and now where are we? Who’s policies are accountable for the current crisis in housing affordability? You’re talking about affordability of market priced housing – unlike Trumm in another response here equating affordability with subsidized housing – right? The policies that have created unaffordable housing, are the ones that created a massive surge in demand. Whose policies? Nickels was mayor, I believe, when Seattle was pouring a billion or so into Paul Allen’s SLU; who was he and Conlin etc. representing? Whose idea was this summer to upzone the University District for 16 story office buildings, to try for a second round of the same? The number of new residential units built here in Seattle is supposed to be a record, far exceeding any previous year (it will be interesting to see after 2017 is over, how it came out, maybe some of the units in the pipeline dried up and we’ll wonder why.) MHA isn’t going to change the game and somehow create a massive change in the rate of building, that already has brought an unusually large share of US cranes to Seattle. Some developer advocates don’t think it’s even good for developers, outside of the big Vulcan category players. We’re still going to fall far short, if the above policy direction succeeds. That’s a “crisis” that will be maintained as long as they can make it go on, because it benefits too many people to stop. Please don’t presume to speak for everyone in Seattle when you deride the SLU area. It might be a bit glass and bougie but it’s certainly better than the endless surface parking lots and abandoned buildings that it was before. Lots of wisdom in all these community groups, time to listen to them and reach a solution. You mean the same wisdom that got us into this housing crisis? I’ll bet you think all the NIMBYs of San Francisco are pretty “wise” to have exponentially driven up the cost of housing there too? Tax Increment Local Transfers (TILTs) might be an effective way to assure neighborhood groups that they will benefit from more intensive development. Basically, in exchange for neighborhood approval of an upzoned building, the city would give them some percentage of the property taxes collected on the new building. The neighborhood could then spend that money as it sees fit: park or street improvements, school support, or even a property tax rebate for homeowners (with some stipulation that it also benefit renters). Of course there needs to be a process to minimize these transfers if they aren’t necessary to gain approval, but in the large this would be an effective way to build support for development in a neighborhood. The way I imagine this working in Seattle is by replacing the Design Review Boards with neighborhood-based boards jointly appointed by the neighborhood group (residents, including a renter) and the city (planners). The city would set some cap on the percentage that could be taken by the neighborhood group based on various metrics (relative FAR, nearby population, proposed use). The board can then bargain with the developer to add public amenities to the building (sidewalk covering, public space, narrower towers, etc.) in exchange for a lowered TILT. The city is majority renter. Especially so in urban villages. How many of these glorified HOAs are majority renter member? 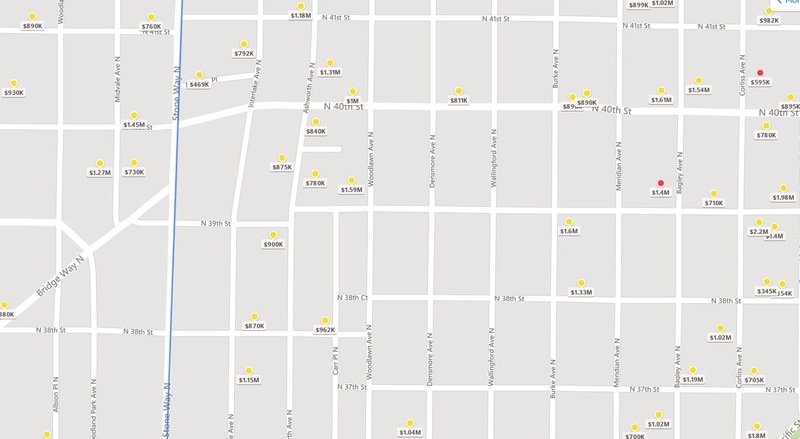 How many of their boards are majority renter? This is a last ditch effort by the anti housing folks, who can’t come close to winning elections, that have spent decades gerrymandering multifamily housing out of single family zones and ensuring that multifamily and affordable housing are illegal in 3/4 of the city’s parcels where housing is even legal. But yeah, it’s pretty heinous and malicious for a bunch of homeowners – many in homes well north of Seattle’s median home value – to sue the city to stop affordable housing in the name of ‘affordability’. no, i’m talking about anti-tenant homeowners dominating ‘neighborhood planning’ and gerrymandered the urban villages to preserve single family zoning from the scourge of duplexes and small apartments. 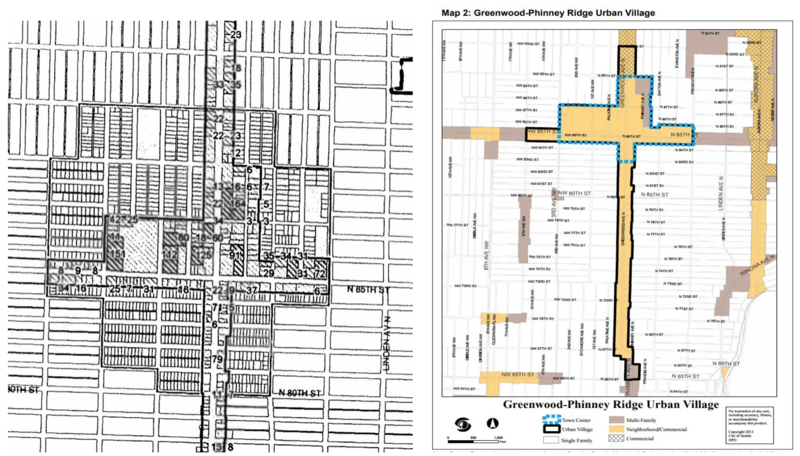 greenwood’s was reduced to just the absurd strip it is today, removing 31 blocks from the UV. queen anne’s UV was halved. even today, wallingford, junction are trying to significantly reduce the boundaries of the urban village.